Theresa May’s response to the overwhelming rejection of her Brexit deal in parliament has been to try to threaten the possibility of crashing out of the EU with no deal – which would have huge negative effects for the British economy in the short term and even worse ones in the long run. This is the equivalent of threatening an economic car crash to try to get parliament to overturn its previous vote. The fight against such a disastrous no deal outcome is being firmly and skilfully led by Jeremy Corbyn – even if the Tory media, which includes the BBC, is doing everything possible to conceal this and pretend other forces are responsible for this fight. Indeed, this struggle against a no deal Brexit clearly shows the correctness of Jeremy Corbyn’s position against alternatives put forward in the Labour Party and also the damaging tactics put forward by the ‘People’s Vote’ campaign. In addition to the obvious fact that blocking a no deal Brexit cannot be won without Labour whipping its MPs to vote against it in Parliament, Jeremy Corbyn was the only major political leader who refused to negotiate with May unless she took the option of a no deal Brexit off the table. This directly placed blocking no deal at the centre of the political agenda. Jeremy Corbyn’s leadership is therefore decisive in blocking no deal. It is a farce that May tried to blame Corbyn for the break-down of her ‘cross-party’ talks. As Osborne pointed out, these talks were always a fig-leaf, an attempt to gain time while she tried to impose her deal by other means. 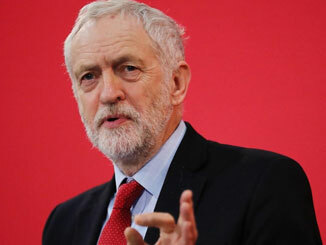 Jeremy Corbyn’s leadership of the opposition to no deal played the decisive role in forcing most other political leaders into publicly adopting the same stance – the SNP was forced to adopt the same stance within 24 hours. Talks with May by a rump of minor parties led by the Lib-Dems, and a few Labour renegades such as Chuka Umunna, rapidly went nowhere. May was therefore rapidly deprived of her fig leaf of time-wasting fake ‘talks’ and forced to confront a concerted opposition to no deal. This may be reflected in a further defeat for May in Parliament, inflicted by Labour, as even a part of the Tory Party will not countenance a ‘no deal’. The Tories throughout this process have been attempting to threaten to achieve only either May’s deal or a no deal result with extremely negative effects for the economy and living standards. Even according to her own government’s forecasts, May’s deal would lower economic growth by 3.9 per cent over fifteen years, while no deal would be much worse, projected to lead to a loss of output of 9.3 per cent. It is not necessary to place blind faith in these forecasts, but simply to acknowledge the fact UK growth has slowed dramatically since Cameron announced the referendum but before Brexit has even happened. Much more fundamental than the short-term economic disruption of no deal, which the media has concentrated on, is the long-term consequences. Under present circumstances by introducing 10 per cent tariffs on most manufactured goods, such as cars, under World Trade Organisation (WTO) rules a no deal Brexit would effectively cut major sectors of the British economy off from European markets and supply chains. This would translate into large working-class job losses. Simultaneously the devaluation of the pound that would result would create inflation and reductions in living standards for millions of people. It is for this reason that Labour and the trade unions have taken such a firm position against a no deal Brexit. Of course, Tory leaders are not at all concerned with preserving living standards and jobs. May is going along with the threat of disastrous no deal Brexit solely because she fears splitting the Tory Party – hence her attempts at all costs to maintain unity with anti-working-class fanatics in the European Research Group (ERG), such as Jacob Rees-Mogg, who dream of Britain as a low regulation, low social protection society on the US model. The other group which May has consistently sought to placate is the sectarian bigots of the DUP. Scandalously, this has even involved threats to include ‘rewriting’ the Good Friday Agreement, effectively ripping it up – threatening the agreement signed by both Republicans and Unionists in Ireland. This would also be the unilateral abrogation of an international treaty between Ireland and Britain, when the Brexiteers claim they are seeking to do deals with the rest of the world. In reality, the Tories are pandering to their own reactionary base and the DUP, which almost alone opposed the Good Friday Agreement. In complete contrast, Jeremy Corbyn, by firmly leading the opposition to no deal, has been defending the interests of the working class by opposing austerity and blocking any Brexit outcome which would lower the living standards of ordinary workers. It was because of his opposition to May’s deal that it was massively rejected, and Corbyn is now the political leader who is most determined and has the best policy and tactics to block no deal. The first step in this was Jeremy Corbyn rejecting the proposals of those within the Labour Party who wanted to vote for May’s deal. As the New Statesman noted of a key Labour meeting some: ‘argued that the Labour Party should vote for Theresa May’s deal to avoid a no-deal exit. At that point, [Diane] Abbott intervened to disagree. She argued that the party’s pro-European membership would never forgive them for bailing out a weak Tory government and that May’s Brexit agreement would in any case be a disaster that Labour should not be seen to endorse.’ Jeremy Corbyn decided Labour policy by firmly rejecting any support for May’s deal. It is clear that for Labour to have supported May’s deal would have been a political disaster. All data shows May’s deal is overwhelmingly rejected by the electorate, by Labour Party members, and by Labour MPs. If Labour had backed May’s deal it would have delivered a dreadful outcome, have gone against the wishes of the electorate, would have seriously damaged Jeremy Corbyn’s support among Labour Party members, and would have led to a huge revolt by Labour MPs – the media headlines now would be dominated by splits in Labour, not splits among the Tories. Jeremy Corbyn’s position from the outset to totally reject May’s deal simultaneously corresponded to the defence of working-class living standards and the possibility to create a progressive Labour government. Austerity policies, carried out by the Tories and in fact supported by the Labour right, are an even worse attack on living standards than any form of Brexit. For that reason securing a Jeremy Corbyn led government, the only leadership which opposes austerity, is the most important issue in British politics – as this website has repeatedly pointed out. It would have been a deadly threat to the possibility of electing such a government to have supported May’s deal as was proposed by some Leave supporters. The general line of march of the Corbyn leadership has been guided by the overwhelming strategic objective of achieving a Corbyn-led Government. This is entirely correct as it corresponds to the interests of the working-class, and so it should be supported by every Corbyn supporter. Jeremy Corbyn’s position has been fully in line with the agreed Brexit policy passed at Labour party conference. The most senior members of the Corbyn left – Jeremy Corbyn, John McDonnell, Diane Abbott – all voted Remain in the 2016 referendum. Polls also show Remain is the overwhelming mainstream opinion in the Corbyn left with this having massive support among both Labour Party members and Labour voters. This website agreed with this. But Jeremy Corbyn also has to take into account that despite the leaders of the Corbyn left, and the overwhelming majority of his supporters, voting Remain it was Leave which won the referendum. Whatever was the demagogy, xenophobia, and straightforward misrepresentation of the Leave campaign this reality has to be faced. It would inevitably take time for dangers to working class living standards of the Leave campaign to becoming clear. Leavers are a minority but a significant part of the Labour electorate, and the Corbyn left, despite their disagreement with Jeremy Corbyn on this issue. It was necessary to have time for the anti-working-class consequences of all forms of hard Brexit to become clear. Therefore, to defend living standards, a key short-term task is to defeat all forms of a hard Brexit – of which a no deal Brexit is the most extreme. If this can be successfully achieved, then this creates the possibility of securing Labour’s goal in its six tests on Brexit of securing: ‘the “exact same benefits” as we currently have as members of the Single Market and Customs Union’. This is crucial in the present circumstances to best defend jobs and living standards. There are two ways to achieve these ‘exact same benefits’– through a Brexit deal along the lines Labour proposes to negotiate or by remaining in the EU. Experience in negotiation will prove which of these is most viable. That is why at present Labour is entirely correct to maintain a coalition of those who want a soft Brexit with those who think only Remain is viable. It should be clear that Labour’s amendment does not commit Labour to support a new referendum on the terms of EU membership or Brexit, it merely says that Parliament should make time to discuss it. Labour is focussed at present on fighting for a general election and blocking a no deal Brexit – any consideration of a referendum would only come later as the Labour Conference resolution supported by Jeremy Corbyn specified. But whatever the final decision taken on a new referendum it is clear that the tactics of the so-called People’s Vote campaign have been damaging both to Labour and to the fight against hard Brexit. Led by the most determined opponents of Corbyn in the Labour right, such as Blair, it has concentrated its activity on attacking Jeremy Corbyn not on the dangers of Brexit/hard Brexit – this is fully in line with the declared position of Blair and others that they do not want Jeremy Corbyn to be Prime Minister. Indeed, these figures are much more concerned to block Jeremy Corbyn than to block Brexit. In addition to their main aim of blocking Jeremy Corbyn the People’s Vote campaign also has deeply damaging tactics in the fight against a hard Brexit. The second possibility is that as became clear what the reality of Brexit meant public opinion would change. That any deal on offer from the EU would be seen as a bad result – and that leaving with no deal would be seen as a bad result. It is quite clear from the opinion polls that this second result is what has been happening. But opinion is changing and forming to different degrees on different issues and with different timescales. The latest very large opinion poll shows that if the issue of Brexit is still posed in the same terms and with the same question as in the 2016 referendum there has been a shift in favour of Remain but it is not very big and certainly not strong enough to guarantee withstanding the strain of a referendum campaign. It found 54 per cent back staying in the EU, while 46 per cent back leaving – that is an 8 per cent majority, not overwhelming. A poll by Survation on the same question found the margin even closer with a 2 per cent majority in favour of Remain. But in contrast for any of the actual real choices available for leaving the EU at present put forward by the Tories there are huge majorities against them. If the choice is Remain versus May’s withdrawal agreement, Remain leads by 26 per cent – 63 per cent to 37 per cent. If the choice is Remain versus leaving the EU without a deal, Remain wins by 16 points: 58 per cent to 42 per cent. This difference could be predicted in advance – that public opinion would only begin to shift when the actual terms of deals (or no deals) for leaving the EU were known. Even Peter Kellner, a committed anti-Corbyn Blairite, and fanatical campaigner for a ‘People’s Vote’ was forced to admit this reality: ‘This pattern is familiar to referendums in different countries: many people support the broad idea of change, but back away when the details are laid out. They want “change”, but not “this change”. ‘The question of how to vote in a 2nd ref can only be answered by saying it depends on options. ‘a) May’s Deal vs Remain: We’d vote Remain. ‘b) No Deal vs Remain: We’d vote Remain. ‘c) Corbyn’s Deal vs Remain: undecided right now. Given that the dynamics are completely clear among everybody from the electorate (most important), through Labour Party members (by an overwhelming majority), through the mainstream Corbynite left, to parts of Corbynite left which disagreed with Corbyn on Remain, the successful tactics that flow from this situation are clear. First Labour quite rightly points out that not Brexit but defence of living standards is the most important issue facing ordinary people. In specifically dealing with Brexit Labour should avoid as much as possible purely abstract discussion about Remain and Leave and instead single mindedly focus on opposing the actual real proposals for Leave on offer, i.e. May’s deal or no deal. That is what clarifies the situation for the electorate – and is the best terrain both for Labour and for blocking any hard Brexit. Doing this is precisely why Jeremy Corbyn and Labour’s tactics have been so successful. This also determines timing and tactics in Parliament. The most urgent thing is to focus on, force absolute clarity on, and vote against what is on offer from the government – May’s deal or no deal. This is not merely correct but because of this aligns Labour most strongly with public opinion. But what the Blairites have wanted to press for is the least successful and most damaging tactics both for Labour and for opposing Brexit/hard Brexit. That is they want Labour to adopt an ‘abstract’ position in favour of a referendum before any vote on the Tories actual proposals. That is, they want to engage in a fight on the terrain which polls show would be the most damaging for Remain – a purely abstract discussion of Remain or Leave. What explains such damaging proposals from the Blairites/Guardian in the People’s Vote campaign? As already noted, it confirms that their real top priority is to attack and block Jeremy Corbyn, not attack and block Brexit. What the Blairites were attempting to do, having been totally defeated in several of their head on offensives against Corbyn, is to utilise the massive majority in the Corbyn left against Brexit, and in particular hard forms of Brexit, in order not to fight Brexit but to try to undermine and attack Corbyn. That is why they advocate tactics which are actually damaging in the fight against Brexit/hard Brexit. What should be understood by the Corbyn left is that it is entirely correct to seek to block the Tory proposals on Brexit. But it is also necessary to have a sense of tactics and timing, that it will take time for the electorate’s opinion to change and understand the real choices, and that the most favourable terrain for the fight is against all the actual and damaging forms of Brexit proposed by the Tories. Jeremy Corbyn’s tactics have been so successful precisely because they understood this reality. It is not yet decided what the final outcome on Brexit will be – the Tories will continue with their anti-working-class offensive around Brexit and will not be defeated easily. But it is clear that the next major step in this struggle is to block a no deal outcome and that this struggle is being led by Jeremy Corbyn. Labour’s position, with Jeremy Corbyn’s leadership, entirely corresponds to defence of working-class living standards. First, to decisively defeat the attacks on working class living standards represented by May’s Brexit deal and then to equally defeat a no deal Brexit. That is a major part of Labour’s overall policy of defending working-class living standards with Jeremy Corbyn’s leadership.